Thread: Best tubs for rack build? So I've slowly been working my way back into the hobby over the past year, after nearly a decade of being away from it. As my collection has grown,I started looking at racks that were commercially available and realized that the can be pretty pricey. Naturally I looked into the hobby standard, sterilite tubs, and while they were close to the same height between the 16 and 32 quart sizes, anything larger or smaller had a much different height. Not to mention the length and width dimensions were very inconsistent, this led to the inability to build something that would comfortably fit more than one or two sizes of tubs in one rack. Then it happened, I was in my local Lowe's hardware store and I stumbled upon the perfect totes. Or at least perfect enough for me. The Hefty brand latching totes are the answer. Not only do the heights of the 6.5,15,34, and big 52 qt tubs all match to within less than .1" of each other, the 15,34, and 52 all share a common dimension in width. All 4 totes measure 6.6" high and the 3 larger sizes share one dimension of 16.75" or so. The only difference is length in either 12", 24", or 36". The 6.5 qt is slightly different at only 12" x 8" x 6.6". What this means is if you build a shelf that is 36" x 18" you can house either 3- 15 qt, 1-34 and 1-15, or 1-52 qt on each shelf, with the two larger sizes having the short side be the depth. And the 6.5 quarts will work as well but be recessed back 6" or so when fully seated. I've built one rack so far with a 36" x 24" shelf so I can sit 2-34 qt's side by side or one 52 sideways, it's a concept rack that I'm testing before I go full size with the idea. It also neatly fits under a workbench in my office/reptile room, so no space wasted. Has anyone else found or used these tubs? And if anybody else wants to take this idea and run with it, I think it could help make multipurpose racks way easier to build/design. The 52qt. Hefty tubs were what I used when I built my rack! I liked the way the uth I used could be fit into the bottom contour well using corrugated plastic and that the length of the tub gave you similar dimensions to a 40B without all the temperature and humidity struggles. What I didn't like on my rack was the wasted space I had using thick pre-fab plastic shelves. Ultimately space economy is why I switched to commercial. Your rack looks great and it's awesome that it can grow with your crew. I think you'll be really happy with it for many years to come! Re: Best tubs for rack build? Sorry for the double post, I had to switch to Tapatalk for the pictures. I also went for the 52qt hefty totes on a DIY build. My primary reason was the bit of extra height and floor space and that unlike the sterilite 41qt tubs, you can perfectly fit a pair of Large RBI hides in it. 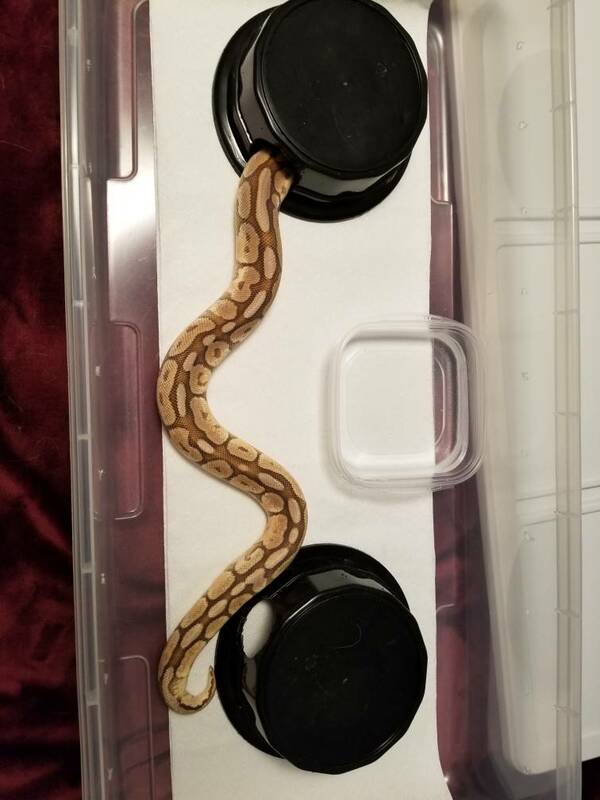 The 41 qt required me to have the door opening of both hides facing the long wall and my snakes shoved that around and made them inaccessible daily. The 52qt you can put them with the doors facing each other at opposite ends. I'm not using it quite yet, but I doubt they will get shoved and blocked as much. 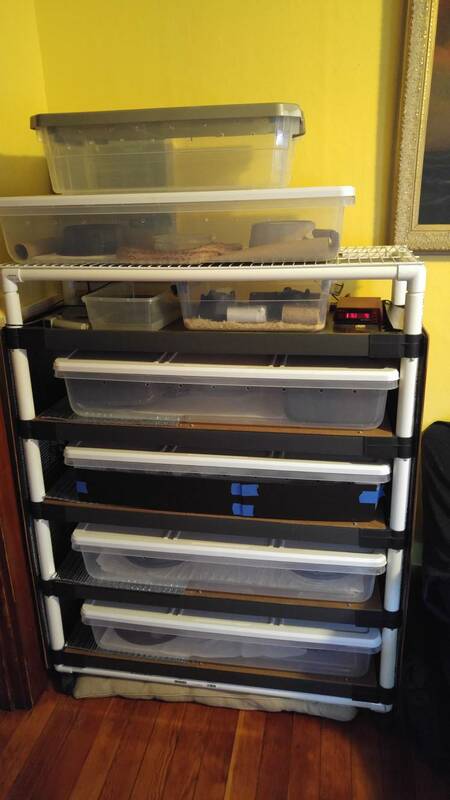 If you are also keeping arboreal species or want to give your snake more vertical space, the Hefty 100-qt has the same footprint as the 52-qt, it's just taller. The same lids fit both. Is your measurement of roughly 6.6" height with the lid on? I know it doesn't add a lot but I see your lids are under the rack instead of on the tubs. I have planning on keeping lids on and drilling holes in sides for better heat/humidity retention. In the process of designing my rack for 2 BP's that I plan to be purchasing at the end of march at a show. I want to buy all the sizes I will need as they grow now and have them ready and have my rack fit all when I build it. Plan ahead and build once. I'm gonna order them and pick up later this week so I can measure then just thought I could get a jump on planning cuts and measurements. Laying out the rack in Fusion 360 (3D cad program) so I can bring a layout with me to Lowes and have them cut the wood for me. BTW, there are 2 versions to that size of tub by Hefty shown there depending which store. Lowes sells them as 52qt with those white lids, but I think some other stores have a "Hi Rise" version (I think listed as a slightly higher volume than 52qt) and the lids stick up by about an extra 1-1.5 inches. The length/width and height of the clear plastic are all identical, so if you skip lids it wouldn't matter, but since you want to use them, just keep that in mind for your sizing. If you use lids and want to offer the higher height for the snakes, you could deliberately go for the hi rise version. They make them with identical heights on hi rise versions of the smaller tubs for the sub-adult and juvenile sized tubs (foot print equivalents roughly to the 16qt and 28qt sterilite tubs, or slightly larger by dimensions). So you would just need to keep with one version or the other. You may have to look around to see who carries all 3 sizes of either one because I never see the smallest normal height one at lowes or elsewhere and haven't noticed the hi rise version of the 52qt where I see the smaller 2 sizes. Hope this helps some. Measurements above are the manufacturer's ones. Thanks. According to the website my local store has all the low ones didn't even think about the taller versions. Will consider that. Want to get all sizes I need up front so they don't discontinue or change them on me.